Meet Melchezedek. In addition to being a world-class chess player, he's a master strategist in the game of EVE. Just kidding. Melchezedek is the guy who left one of these in the cargo bay of his Hulk. His 1.1 billion isk loss was featured on the most recent Kills of the Week post. Needless to say, Melchezedek is not actually a master strategist. And if he plays chess at all, I'm guessing he's really bad at it. Now there's your strategist. 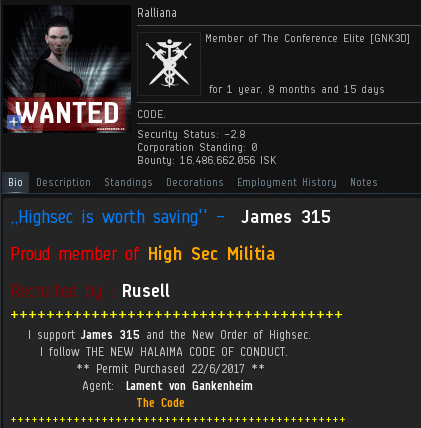 Agent Ralliana is one of EVE's most elite PvP'ers. In case you were wondering, her bio's reference to the High Sec Militia is a joke--much like the High Sec Militia itself. And Rusell, for that matter. Melchezedek made a grave miscalculation. We know that PLEX and skill injectors tend to encourage carebears to make poor decisions, but rarely are their mistakes so costly as this miner's. 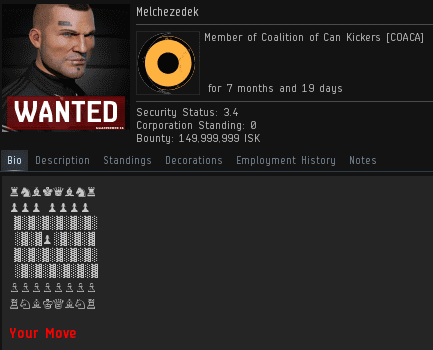 Melchezedek kept buying PLEX until he ran out of isk, then liquidated his skill points and ran out of those, as well. With no money or skill points, Melchezedek was forced to start at square one. What about all of his knowledge and experience, you ask? It consisted of AFK mining in highsec. Not much of a climb up the EVE learning cliff. Of course, you don't need skill points to invoke the "gankers reduce CCP's subscription revenues" myth. We see new players popping off with that one all the time. They must be teaching that nonsense in the EVE tutorial. Ralliana offered the miner something far more valuable than isk or skill points: the Code. Melchezedek didn't see the use in it, but it would've saved him. The New Order attracts the most compassionate people in the game. Agent Ralliana was so sensitive to Melchezedek's plight that she didn't mock him for keeping the skill injector in his Hulk in the first place. Ralliana gently linked the name of the Saviour of Highsec. Instant tears. Melchezedek was a Goofus! The miner informed our Agent that he would no longer be able to make his extraordinary contributions to the EVE community. But I believe we'll somehow find a way to survive without him. Ours is a resilient community. Because, after all, the EVE community is powered by the Code. In case you were wondering, her bio's reference to the High Sec Militia is a joke--much like the High Sec Militia itself. And Rusell, for that matter. HAHAHAHAHAAHAHAHAHAHAHA. hitting the nail on the head. Is that Sperglord Rusell still around? I thought he ragequit after even ag channel thought he was too toxic. He's probably still lurking around on an alt. I have to agree. But the problem with ratting, at least for miners, is that it ain't afk activity. Wow! So basically you're a bunch of autistic internet troll? I guess that's what happen when you have a sad pathetic life... A good power trip on EVE, killing unarmed ship, to feel like a Alpha Male! Do you steal candy from kids? I sure your one real badass! BTW... If you want to troll someone, can you write ''experience'' and not ''experiance'' I know, high school is really tough but you look less stupid! Jeez! I guess your plan is not that good! Sorry! You are a victim of your own doing. Keep crying and never forget shardani. Miner, calm down. Who's the sperg cryimg over internet rp? Oh yea, you are. You are the type of simple minded shitter we enjoy laughing at, yes. But that don't mean there's anything wrong with us, it meams you are too stupid to see the big picture. I guess it's not your fault that mommy was on acid when she was preggo huh? Oh the irony of Melchezedek's previous corp names.... Original Ganksters? The mining in Avada has been pretty lucrative so far this month. I may break my ISK record set last month. If you go around mining without a care in the world, illegally mind you, then you should probably get blown up. The fact that you carry around a large skill injector will doing so is just madness.